^ Otsuka, Keijiro. “Poverty Reduction Issues: Village Economy Perspective.” Asian Development Review, July 2001. ^ a b Otsuka, Keijiro and Frank Place. Land Tenure and Natural Resource Management: A Comparative Study of Agrarian Communities in Asia and Africa. Baltimore, MD: Johns Hopkins University Press, 2001. ^ a b c d e f g h i j k l m n o 大塚啓二郎 (2003年3月). ﻿東アジアの食糧・農業問題﻿ (Report). 経済社会総合研究所. http://www.esri.go.jp/jp/tie/ea/ea2.pdf. ^ chapter 4a, An adventure in applied science: A history of the International Rice Research Institute, Robert F. Chandler Jr.
^ Xu Y.L. et al. (1995) "The GA5 locus of Arabidopsis thaliana encodes a multifunctional gibberellin 20-oxidase: molecular cloning and functional expression" PNAS 92:6640-6644. ^ Silverstone A.L. et al. (1997) "Developmental regulation of the gibberellin biosynthetic gene GA1 in Arabidopsis thaliana." Plant J. 12:9-19. ^ Silverstone A.L., C.N.Ciampaglio, and T.Sun (1998) "The Arabidopsis RGA gene encodes a transcriptional regulator repressing the gibberellin signal transduction pathway." Plant Cell 10:155-167. ^ Appleford N.E.J. et al. (2007) "Decreased shoot stature and grain -amylase activity following ectopic expression of a gibberellin 2-oxidase gene in transgenic wheat" JXB Advance Access published online on October 4, 2007 1-14. ^ Otsuka, Keijiro, Fe Gascon, and Seki Asano. “’Second Generation’ MVs and the Evolution of the Green Revolution: The Case of Central Luzon, 1966-90.” Agricultural Economics 10 (3), May 1994, pp. 283-95. ^ Estudillo, Jonna P and Keijiro Otsuka. 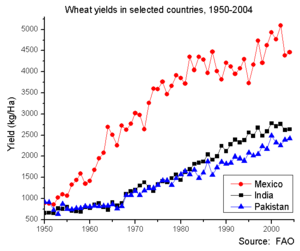 “Has Green Revolution Ended? A Review of Long-Term Trends in MV Adoption, Rice Yields, and Rice Income in Central Luzon, 1966-98.” Japanese Journal of Rural Economics 3, 2001, pp. 51-64. ^ a b c Pingali, P.L., M. Hossain, and R.V. Gerpacio. Asian Rice Bowls: The Returning Crisis? Wallingford, UK: CAB International. ^ a b c d David, Cristina C. and Keijiro Otsuka. "Modern Rice Technology and Income Distribution in Asia. ", Boulder, Col.: Lynne Rienner, 1994. ^ Otsuka, Keijiro. “Role of Agricultural Research in Poverty Reduction: Lessons from Asian Experience.” Food Policy 25 (4), August 2000, pp. 447-62. ^ Binswanger, Hans P. and Jimmy Quizon. “What Can Agriculture Do for the Poorest Rural Groups?” In I. Adelman and S. Lane (eds. ), The Balance between Industry and Agriculture in Economic Development. New York: St. Martin’s Press, 1989. ^ Hayami, Yujiro. Development Economics. Oxford: Clarendon Press, 1997. ^ Hayami, Yujiro and Masao Kikuchi. Asian Village Economy at the Crossroads. Minneapolis, MN: University of Minnesota Press, 1982. ^ Estudillo, Jonna P and Keijiro Otsuka., “Has Green Revolution Ended? A Review of Long-Term Trends in MV Adoption, Rice Yields, and Rice Income in Central Luzon, 1966-98.”, Japanese Journal of Rural Economics 3, 2001, pp. 51-64. ^ ルース・ドフリース『食糧と人類：飢餓を克服した大増産の文明史』小川敏子訳 日本経済新聞出版社 2016年、ISBN 9784532169817 pp.222-244. ^ a b Defining the Green Revolution - What Was the Green Revolution? ^ Defining the Green Revolution - What Was the Green Revolution? ^ De Datta S.K., Tauro A.C. and Balaoing S.N. (1968)"Effect of plant type and nitrogen level on growth characteristics and grain yield of indica rice in the tropics." Agron. J. 60:643-647. ^ The Wall Street Journal - "Feeding Billions, A Grain at a Time"
^ Oasa, Edmud K. (1987)"The Political Economy of International Agricultural Research in Glass", Bernhard, ed., The Green Revolution Revisited, pp.13–55. ^ Brown, Lester. (1970) "Seeds of Change." New York: Praeger Publishers. ^ a b c d Conway, Gordon. (1998) "The Doubly Green Revolution." Ithaca: Cornell University Press. ^ Church, Norman (2005) "Why Our Food is So Dependent on Oil"
^ Sherer, Dennis (2007) "Fuel costs, drought influence price increase", TimesDaily. ^ Trumbull, Mark (2007) "Rising food prices curb aid to global poor"
^ BBC - "The end of India's green revolution? "